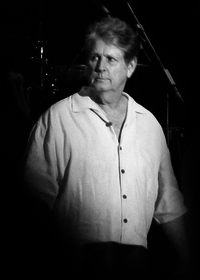 Brian Douglas Wilson (born June 20, 1942) is an American musician best known as the chief songwriter of the Beach Boys. Besides acting as their co-lead vocalist, he also functioned as the band's main producer and arranger. After signing with Capitol Records in mid-1962, Wilson wrote or co-wrote more than two dozen Top 40 hits for the Beach Boys. In the mid-1960s, Wilson used his increasingly creative ambitions to compose and produce Pet Sounds, considered one of the greatest albums of all time. The intended follow-up to Pet Sounds, Smile, was cancelled for various reasons, which included Wilson's deteriorating mental health. As he suffered through multiple nervous breakdowns, Wilson's contributions to the Beach Boys diminished and his erratic behavior led to tensions with the band. After years of treatment and recuperation, he began a solo career in 1988 with Brian Wilson, the same year that he and the Beach Boys were inducted into the Rock and Roll Hall of Fame. Since then, he has toured for the first time in decades with a new band and released acclaimed albums, including Brian Wilson Presents Smile, for which Wilson won his first Grammy Award for "Mrs. O'Leary's Cow" as Best Rock Instrumental. On December 16, 2011, a 50th anniversary Beach Boys reunion tour was announced and Wilson briefly returned to the group. He remains a member of the Beach Boys corporation, Brother Records Incorporated. • Neil Diamond thanks fans for "love and support"
• David Cassidy's death mourned: "His memory and love will live on"
• Musicians mourn Tom Petty: "This one hurts"
This webpage uses material from the Wikipedia article "Brian_Wilson" and is licensed under the GNU Free Documentation License. Reality TV World is not responsible for any errors or omissions the Wikipedia article may contain.